One thing I love about the end of summer is that stone fruits are literally falling out of the trees. 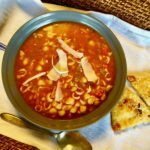 Another thing I love is that it is so easy to do most of your cooking and baking outdoors which helps keep the house a little cooler come August and September. 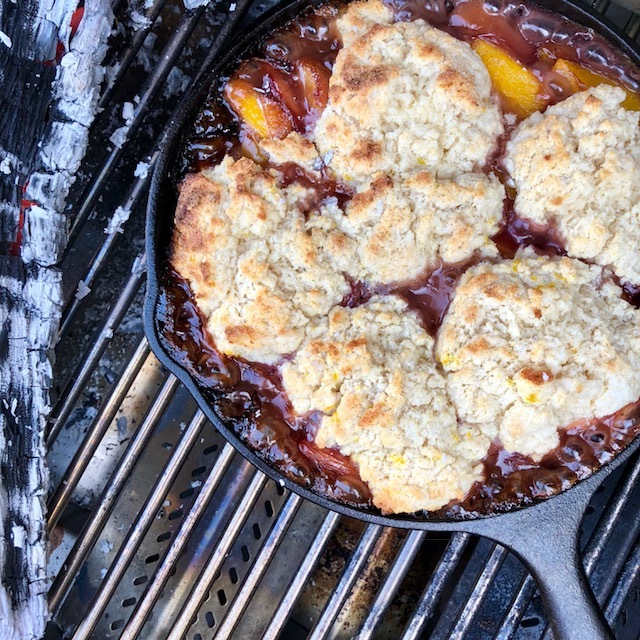 This stone fruit cobbler recipe was just published in the food section of The San Diego Union Tribune and since they get first crack at it, I am free to share on my blog now. 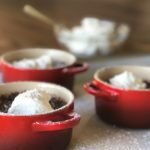 This dessert is easy to make and it is enhanced by the smokiness of the outdoor cooking, it really deepens the flavors in a subtle way. If you are using a gas grill, you can place a little foil pouch of soaked wood chips off to one side; they will provide just enough smoke to make a big difference in the flavor. Seriously, try it. Allow the cobbler to cool for at least 15 minutes before serving and pahleeze, whatever you do…. top it with vanilla ice-cream, or better yet my recipe for Basil Black Cherry ice cream posted this month also. Preheat your grill to read 350 to 375 degrees. Turn on only one side of heat or spread briquettes out over only one half of grill. Butter a 9 to 10-inch cast iron pan. Place fruit in large bowl. Combine sugar, flour, cornstarch, cinnamon, orange zest and salt in small bowl and sprinkle over fresh fruit. Cut butter into small pieces and dot around evenly over fruit. 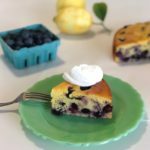 Place on grill and cook for 10-15 minutes until fruit softens and juice is bubbly and thick. Sift all dry ingredients together in medium sized bowl. Sprinkle zest over top of dry ingredients and evenly distribute with a fork. In a separate bowl, stir together buttermilk and melted butter, and then add to dry mixture. Gently fold to just combine (dough will be shaggy). Once fruit is cooked, slide off heated side of grill and add dollops of biscuit dough over the top of fruit (like making dumplings). Turn lid down on grill and bake uncovered on non-flame side of grill until biscuit topping is thoroughly cooked and golden brown, about 15 minutes.